In the 1970s, two Helios spacecraft and the Skylab Apollo Telescope Mount provided scientists with significant new data on solar wind and the solar corona. The Helios 1 and 2 probes was a joint U.S.–German probe that studied the solar wind from an orbit carrying the spacecraft inside Mercury's orbit at perihelion. The Skylab space station, launched by NASA in 1973, included a solar observatory module called the Apollo Telescope Mount that was operated by astronauts resident on the station. Skylab made the first time-resolved observations of the solar transition region and of ultraviolet emissions from the solar corona. Discoveries included the first observations of coronal mass ejections, then called "coronal transients", and of coronal holes, now known to be intimately associated with the solar wind. Launched in 1991, Japan's Yohkoh (Sunbeam) satellite observed solar flares at X-ray wavelengths. Mission data allowed scientists to identify several different types of flares, and also demonstrated that the corona away from regions of peak activity was much more dynamic and active than had previously been supposed. Yohkoh observed an entire solar cycle but went into standby mode when an annular eclipse in 2001 caused it to lose its lock on the Sun. It was destroyed by atmospheric reentry in 2005. One of the most important solar missions to date has been the Solar and Heliospheric Observatory, jointly built by the European Space Agency and NASA and launched on 2 December 1995. Originally intended to serve a two-year mission, SOHO is still in operation as of 2009. It has proven so useful that a follow-on mission, the Solar Dynamics Observatory, is planned for launch in November 2009. Situated at the Lagrangian point between the Earth and the Sun (at which the gravitational pull from both is equal), SOHO has provided a constant view of the Sun at many wavelengths since its launch. In addition to its direct solar observation, SOHO has enabled the discovery of large numbers of comets, mostly very tiny sungrazing comets which incinerate as they pass the Sun. All these satellites have observed the Sun from the plane of the ecliptic, and so have only observed its equatorial regions in detail. The Ulysses probe was launched in 1990 to study the Sun's polar regions. It first traveled to Jupiter, to "slingshot" past the planet into an orbit which would take it far above the plane of the ecliptic. Serendipitously, it was well-placed to observe the collision of Comet Shoemaker-Levy 9 with Jupiter in 1994. Once Ulysses was in its scheduled orbit, it began observing the solar wind and magnetic field strength at high solar latitudes, finding that the solar wind from high latitudes was moving at about 750 km/s which was slower than expected, and that there were large magnetic waves emerging from high latitudes which scattered galactic cosmic rays. 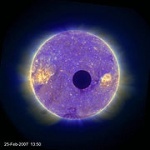 The Moon passing in front of the Sun, as taken by the STEREO-B spacecraft on February 25, 2007. Because the satellite is in an Earth-trailing orbit and is further from the Moon than the Earth is, the Moon appears smaller than the Sun. Source: Phillips, T. (2007). "Stereo Eclipse". [email protected] NASA.